The Pathfinder acts as a spine supporting the telescope’s primary mirror segments and is a non-flight prototype. The mirrors were placed on Pathfinder using a robotic arm move that involved highly trained engineers from Exelis, Northrup Grumman and NASA. 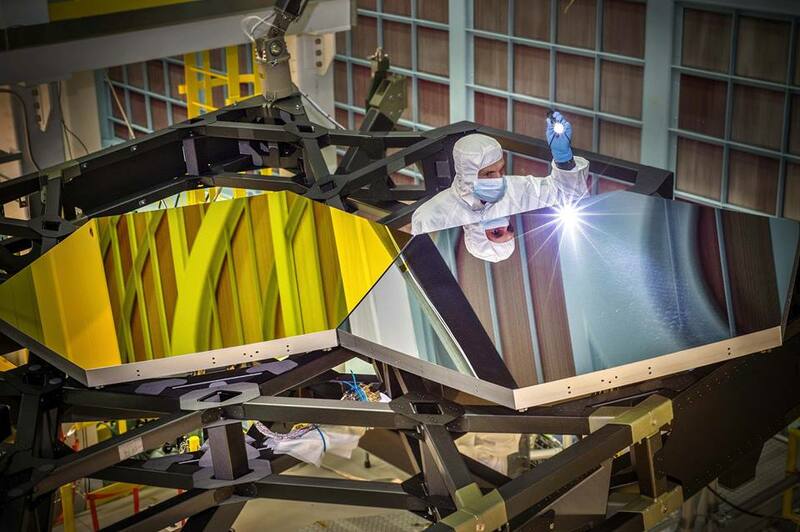 Colorado’s Ball Aerospace & Technologies Corp. is responsible for the eighteen primary mirrors that make up the James Webb Space Telescope. Once on orbit, the 18 hexagonal segments will work togetehr as one 21.3-foot (6.5-meter) primary mirror, the largest mirror ever flown in space and the first to deploy in space. Ball Aerospace was also responsible for developing the secondary mirror, tertiary mirror and fine-steering mirror. Also recently, a major test of the telescope’s sunshield was conducted by Northrop Grumman in Redondo Beach, California. For the first time, the five sunshield test layers were unfolded and separated, unveiling important insights for the engineers and technicians as to how the deployment will take place when the telescope launches into place. The three-day test took seven engineers and six technicians about 20 hours to complete. On orbit, the sunshield will take several days to unfold. 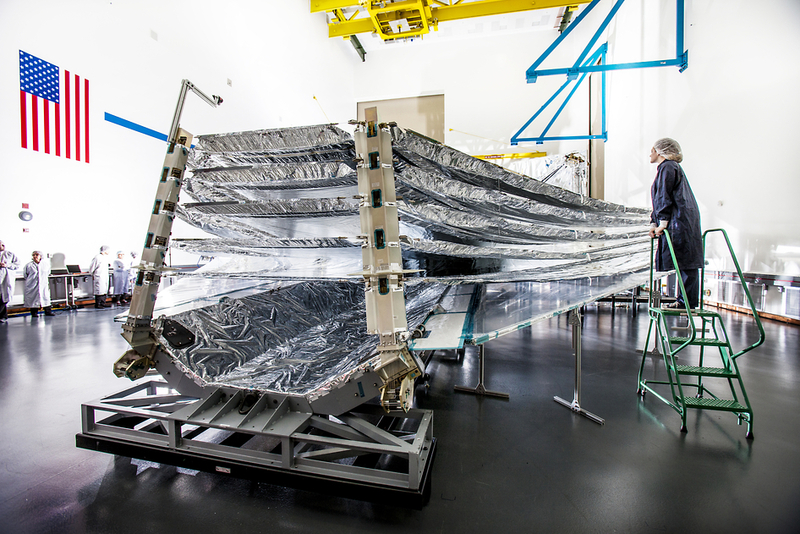 The tennis-court sized sunshield, which is the largest part of the observatory, will be folded up around the Webb telescope’s mirrors and instruments during the launch. As the telescope travels to its orbit on million miles from Earth, it will receive a command to unfold and separate the sunshield’s five layers into their precisely stacked arrangement with its kite-like shape. The sunshield separates the observatory into a warm, sun-facing side (reaching temperatures close to 400 degrees Fahrenheit) and a cold side (185 degrees below zero Fahrenheit) where the sunlight is blocked from interfering with the sensitive telescope instruments. The sunshield’s membrane layers, each as thin as a human hair, are made of Kapton, a tough, high-performance plastic coated with a reflective metal. Northrop Grumman subcontractor NeXolve is currently manufacturing the flight sunshield layers at their facilities in Huntsville, Alabama. The five flight layers will be delivered to Northrop Grumman in 2016, when extensive testing will continue, followed by integration with the entire observatory. The James Webb Space Telescope is the successor to NASA’s Hubble Space Telescope. It will be the most powerful space telescope ever built, able to detect the light from the first galaxies ever formed and explore planets around distant stars. It will study every phase of our universe’s history, ranging from the first luminous glows after the Big Bang, to the formation of stellar systems capable of supporting life on planets like Earth, to the evolution of our own Solar System. Webb is an international project led by NASA with its partners, the European Space Ageny and the Canadian Space Agency. The Near Infrared Camera (NIRCam), which will function as the central imaging component of the telescope, was designed, built, and tested by a University of Arizona/Lockheed Martin team at Lockheed’s Advanced Technology Center in Palo Alto, California. Lockheed Martin is responsible for the optical, mechanical, structural, thermal and electronic precision mechanisms and the control software of NIRCam.